As this weekend is Easter weekend and we have a distinct lack of any egg-shaped chocolate in the house, we’re going to concentrate not on the chocolate variety but on those protein-packed staples that are produced by the chicken. Yes, we like to keep it real, here! We’re doing egg recipes! Eggs feature heavily in Turkish cuisine, which isn’t surprising when you see the number of chickens popping up in random places. We’ve got used to this now and don’t really give them a second glance – it’s still quite common in Turkey for families to keep chickens, even in urban areas. These are the true free range chickens. They don’t carry with them any special labels such as ‘corn-fed.’ They’re not given x amount of metres per space per chicken so they can be labelled as ‘free range.’ No, they wander, they peck at the ground and eat whatever they find, they eat whatever their owners put out for them…and they produce the most fantastic eggs! These are the eggs that are sold as köy yumurtası (village eggs) at your local market and you need to keep an eye out for them. They’re likely to be in a large plastic bowl, or already bagged up, and they can appear on any stall – it just depends whose hens have laid. Prices per egg can fluctuate massively, even reaching a staggering 1TL per egg at some points. But, whenever possible, these are the eggs we buy for our Turkish egg recipes. They’re sometimes difficult to find, they’re certainly difficult to carry, but they’re definitely worth your extra kuruş. So what do we do after we’ve gone to all that effort to ferry home our village eggs without ending up with a sticky yolky mess? Menemen is special. Most people who come to Turkey for the first time ask what menemen is. And, when they’re told, they look dubious about it. And then they decide to order it. The menemen is placed before them. It doesn’t look too appetising, that mixture of scrambled eggs and vegetables. Tentatively, they take a forkful and place it in their mouth and then BAM, another menemen convert. This Turkish brunch dish is genius and shows off the village egg perfectly. 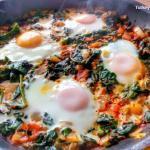 If you’d like to make this, here’s our Menemen recipe. There aren’t many better ways of passing a few hours on a Sunday morning than by sitting with friends and sharing a Turkish village breakfast (köy kahvaltısı). Village eggs with village breakfast – perfect! The village breakfast trend in Fethiye continues to gain momentum and, these days, when you order, it’s rare that you won’t be asked how you’d like your eggs; boiled or fried. Difficult to resist a little pan of fried village eggs topped with a sprinkling of chilli flakes! We had this particular köy kahvaltısı in Üzümlü, en route to the Üzümlü Mushroom Festival, some time. Hmm, didn’t we just say menemen was genius? Didn’t we just say there was nothing better than sitting down to a Turkish village breakfast? So where does sucuklu yumurta (fried eggs with sucuk) fit into this gushing equation? 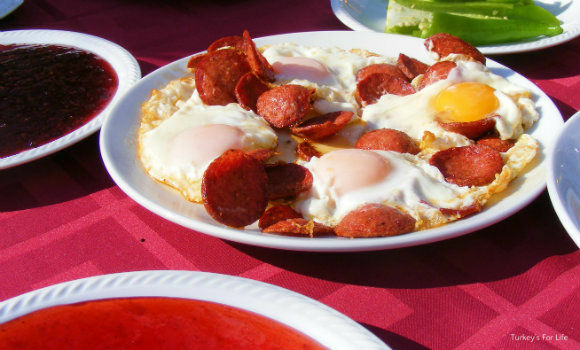 Sucuklu yumurta with fresh, crusty bread is fabulous in its own right, especially with a runny yolk. But then you can also combine with it with a village breakfast. A double whammy of two Turkish breakfasts in one! This particular happy event came about for us when we went out with friends to Yalçın in Kayaköy for our Sunday köy kahvaltısı. You can get sucuklu yumurta as a standalone brunch at places like Taşyaka Baba Fırın in Fethiye. Or, of course, you could always use your own village eggs to make sucuklu yumurta at home. Turkish egg recipes are not just breakfast dishes, of course. Piyaz is a Turkish white bean salad and the Antalya version is special in that it also contains tahini. The Antalya-style piyaz is often topped with hard-boiled eggs – and what better way to celebrate the sunburst yellow yolk of the village egg than simply boiling it, slicing it into quarters and decorating your dish. Added bonus if you get the double yolks! Here’s our recipe for Antalya Usulü Piyaz. Served with Tekirdağ Köftesi, it’s truly a delight! Another of our favourite Turkish egg recipes – if you thought you didn’t like spinach (we were certainly in that camp before we came out to Turkey), go all out for this spinach and egg dish. And you might just have the same epiphany we did when we first tried ıspanaklı yumurta: that spinach is not only healthy and versatile but also damn good! And well, a fried egg sat atop a piece of hot toast is always going to work, isn’t it? Click the link to try out our recipe for Ispanaklı Yumurta. Traditional Turkish eggy bread. Yummy! Mmm, and we can’t celebrate Turkish egg recipes without the inclusion of the oh so delicious yumuratlı ekmek. 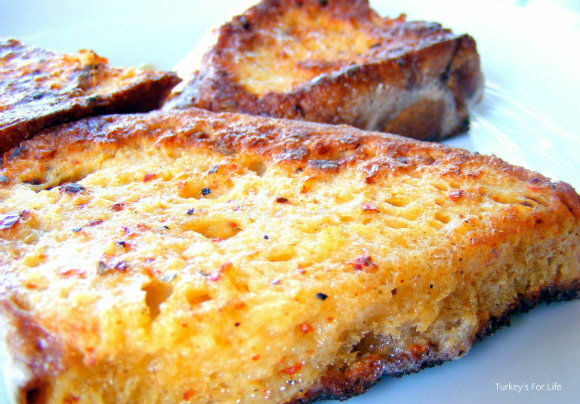 Eggy bread is a great weekend treat in our house. A few chilli flakes and a big dollop of natural Turkish yoghurt. Happy days. Here’s how we make Turkish eggy bread at home. 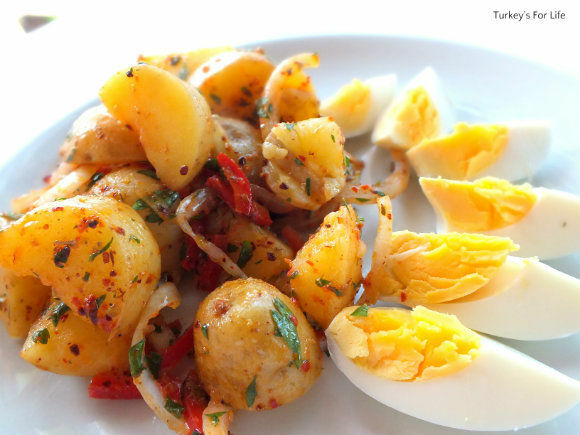 How has potato salad made it into our list of favourite Turkish egg recipes? Well, in springtime, we love it when the baby new potatoes appear on the market. They make a great potato salad – as well as other meals, of course. If you ever get invited to someone’s home in Turkey and potato salad is ploaced on the table, you will often see eggs as part of the dish. And it works. Give our (eggy) potato salad recipe a try. These are just a few of our favourite ways that eggs are used in Turkish cuisine. 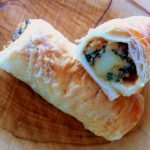 There are so many more Turkish egg recipes out there. And, obviously, lots more Turkish recipes, too. What’s your favourite meal that best celebrates the egg for you? Take a slice of bread and flattened if with a pastry roller to make it tin. Butter the inside of a muffin pan and press the slice of flat bread all around inside each one. Press over the bread a tin slice of ham all around or bits of diced bacon or sucuk, add a bit of spinach or cooked sliced mushroom, break one egg in the middle then cover with cheese and pepper flakes and cook in the oven until the egg is cook. With the muffin pan, you can make 6baskets of eggs and serve then in a plate with anything like a carrot salad, green salad, etc. They egg nests look nice and are delicious. Men usually eat two in my family, kids love it and women want to eat two but hesitate!!! I love a good ol’ menemen for breakfast, or sucuklu yumurta 🙂 You can not “not have” yumurta for breakfast! 🙂 Thanks for this round up. @ ilke: Very true. You can not not have yumurta for breakfast. 🙂 Sucuklu yumurta is just yummy isn’t it? Hi Julia! I have been so busy with the culinary walks that I have hardly had a moment for blogging! I liked your comment that eggs feature heavily in the Turkish cuisine: I had never truly taken that on board but I suppose your’re right! And we LOVE those köy yumurta – the best! Happy Easter to you and Barry! @ Claudia Turgut: Happy Easter to you, too. Good to hear you’re busy with your culinary walks. Well, we could have gone overboard with the eggs and started talking about cakes etc but thought we’d leave it to the visible Turkish recipes. 🙂 Köy yumurta are definitely the best. Yes! I found a box of mini chocolate eggs in Gima – Result! I can go to the egg hunt how.